I found a poem today and was flattered because I think it’s for me. Clio and her musical karate team — how strange and fun. This line reminds me of a mill in Georgia I used to fish near with my grandfather when I was younger, “Now we sit in a mill & I draw light from it like water.” Lovely. And the final line brings everything together so gracefully, “I have swooped down like that eagle for these few phrases, improvised.” Jammin. 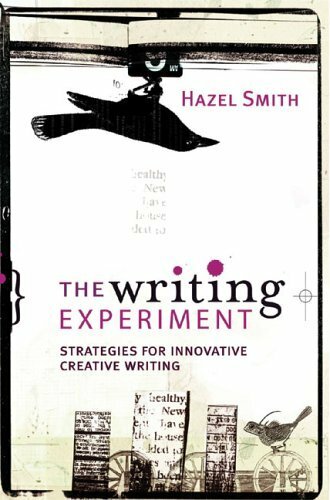 In other news, I finally received Hazel Smith’s new book, The Writing Experiment: Strategies for Innovative Creative Writing, from my little local post office and was psyched all over again. Every time I get a new book, I imagine I will somehow become a better person. Sometimes I do. In this case, I’ll bet the farm, eggshells and all, on it. From the beginning, “The main take-home message from this volume is that it is possible to work out ways to write, and that experimentation is fundamental to creativity.” Can I get a hell yes, please? Also, “Writing in the contemporary era needs to be redefined as a very broad category, which includes audiovisual projects, performance works, multimedia and hypermedia works, not just written texts. These kinds of creative endeavours are included, and encouraged, in this book.” Where’s my amen, fellow audience members?